After obtaining a sample of a program called Sure PC Backup malware experts at our internal labs have executed an extensive analysis of it and has finally classified it as an adware application. Such classification has been made due to the invasive operations that this program performs within your operating system, which eventually causes major disruptions within your web browser. Unfortunately, often users are simply tricked into acquiring this piece of unwanted software by manipulative marketing gimmicks. On its official website, this application is advertised as a tool that should allow you to backup you valuable data and host it on the web. While such functionality seems extremely useful, in reality, Sure PC Backup does not operate in such a way at all as it is mostly capable of turning your whole online experience into one big mess. If unfortunately you already have it fully active on your personal computer do not take any chances with it, and remove it by using the comprehensive instructions presented below. It goes without saying that there are no actual good reasons why this adware program should be kept on any users computer. As soon as this application enters your operating system, it will provide you with an application icon on your desktop. Once you try to launch it a redirection within your web browser will be triggered to a questionable third-party website. Upon further investigation, it has been found out that the program in question will in no way provide you with an ability to back up your virtual content. In fact, the program itself often crashes and acts in a random way. In reality, this application will initiate connections to an adware servers, which will provide you with unwanted web content as you are surfing the web. It is important to note that the ad-supported program contacts numerous servers all around the world; thus, the overall functionality of this adware does not depend on the region. It goes without saying that all the ads, pop-ups, and coupons, provided by it will be of no use whatsoever. In fact, they will only cause mess within popular browsers, such as Mozilla Firefox, Internet Explorer, and Google Chrome, meaning that your Internet experience will be turned into a negative and challenging one because at times you might need to close down all the invasive content just to continue your web surfing session. It goes without saying that there is no useful feature that would make sense running Sure PC Backup on your computer. 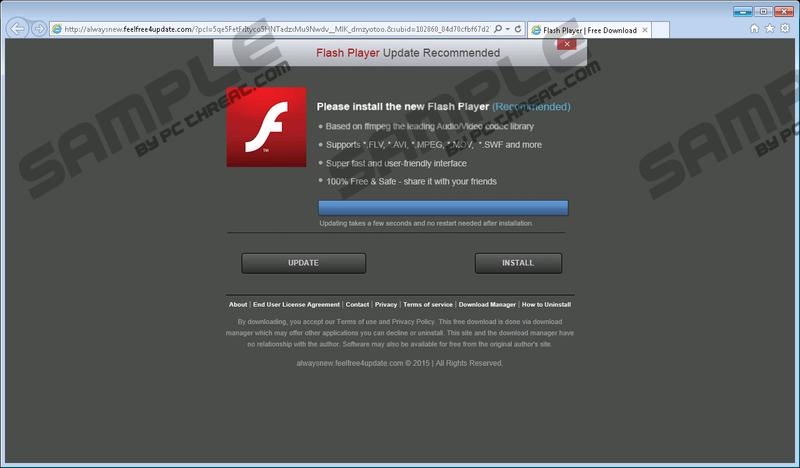 To browse the web the way you are used to you are required to execute a complete removal of this adware immediately. During the investigation of the content presented by Sure PC Backup, our malware experts have come across some potentially alarming facts. It has been found out that since the ads, coupons, and pop-ups are provided to you randomly from suspicious adware servers, you might come across content that could redirect you to suspicious third-party sites. This could happen because some ads and pop-ups might be implemented with redirect links. Therefore, it is not surprising that we advise you to avoid all third-party web content that this adware might present you with. It is imperative to do so since you could get redirected to sites that might cause harm to your operating system. For example, you could be taken to a site that might be full of dubious software or even worse - it could be running an arbitrary code execution exploit. Just landing on a website with such an exploit might be enough to infect your PC with any kind of malicious application. Do not ignore Sure PC Backup as running it on your computer could have detrimental outcomes. If you already have this ad-supported application on your PC, we highly advise you to check for other questionable applications, just to be on a safe side. By now it should be more than obvious why the complete removal of Sure PC Backup is a must. Follow the instructions that we present below and you should be able to delete Sure PC Backup from your PC entirely. Once you are done with the removal guide, we advise you to restart your personal computer so the changes could take place. If after conducting all these steps your browser is still full of dubious ads, pop-ups, and coupons, you should conduct an extensive analysis of your operating system for potential leftovers linked to Sure PC Backup. In some cases, users might not feel comfortable performing the manual removal themselves as it may seem too challenging. If you happen to be such a user, make sure to terminate this ad-supported application with a reliable antimalware tool. Double-click the Sure PC Backup. Quick & tested solution for Sure PC Backup removal.